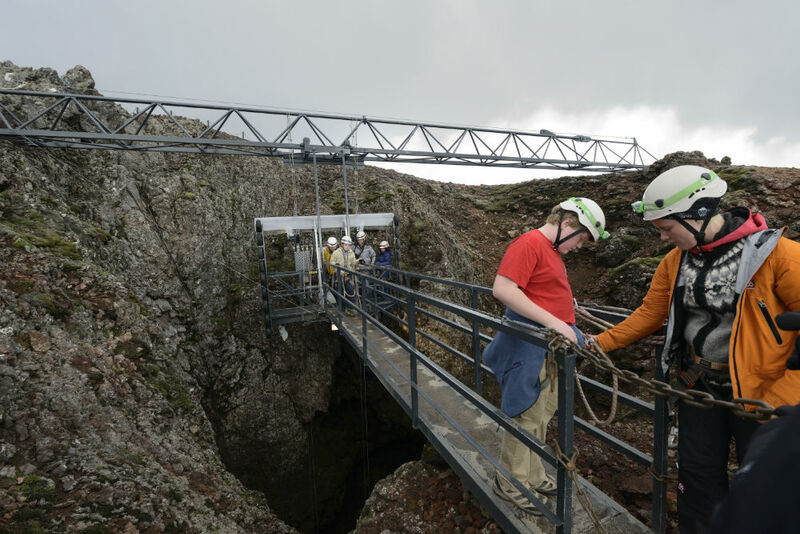 Would You Take the Plunge Into an Icelandic Volcano? 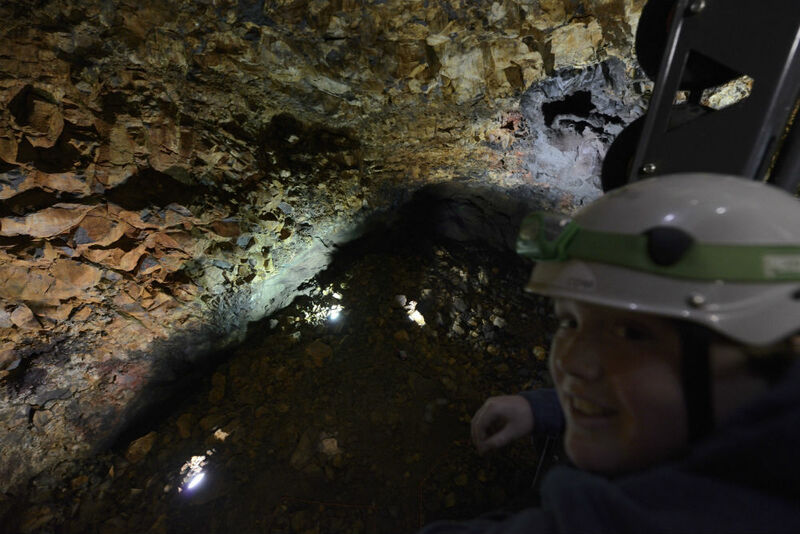 Note from Wendy: During our Iceland adventure last month, while I made a day trip to Greenland, Tim and the kids ventured deep down inside a volcano. Here, Tim describes the experience—and his advice for anyone thinking of trying it. Like adventure? 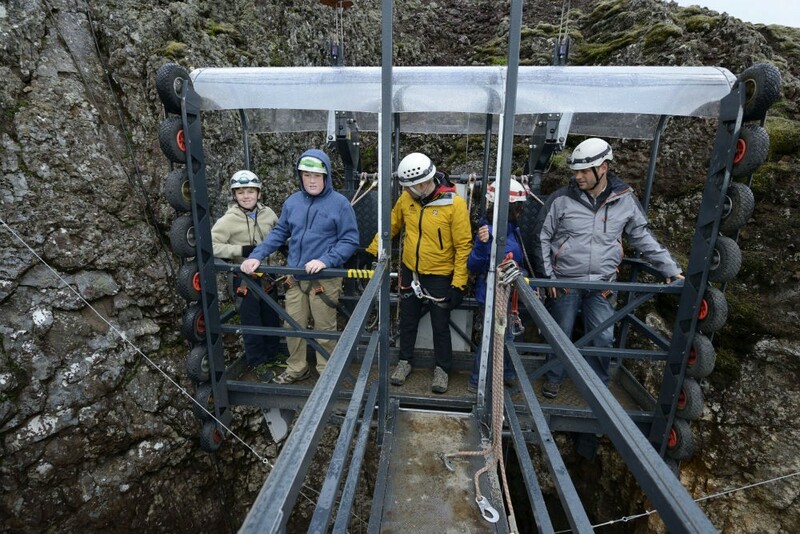 How about being lowered the equivalent of 40 floors—in a window washer’s scaffold—into a volcano in Iceland? Never mind that its last eruption was 4,000 years ago and some scientists say there is no such thing as an extinct volcano. 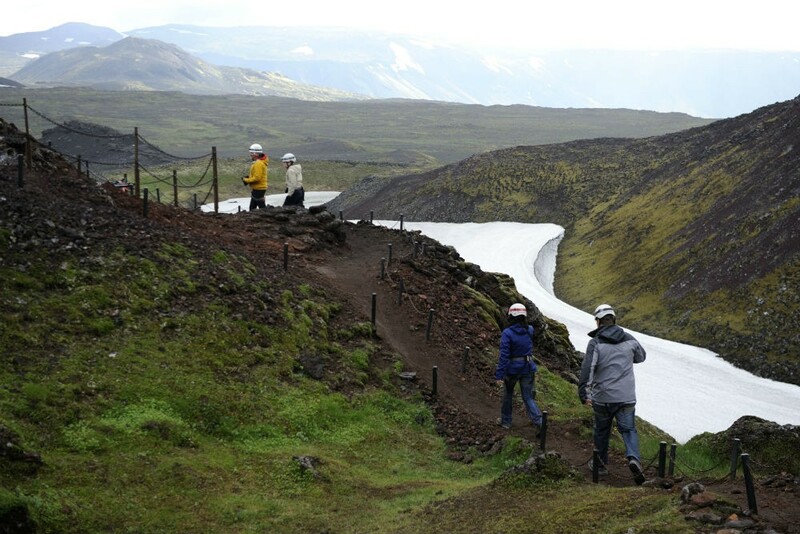 Or that Iceland is one of the most active volcano and earthquake zones in the world, and earthquakes could dislodge rocks onto the visitors below. Or that, if the power goes out or there is a malfunction with the scaffold, you’ll be stuck down there in the dark. Still interested? 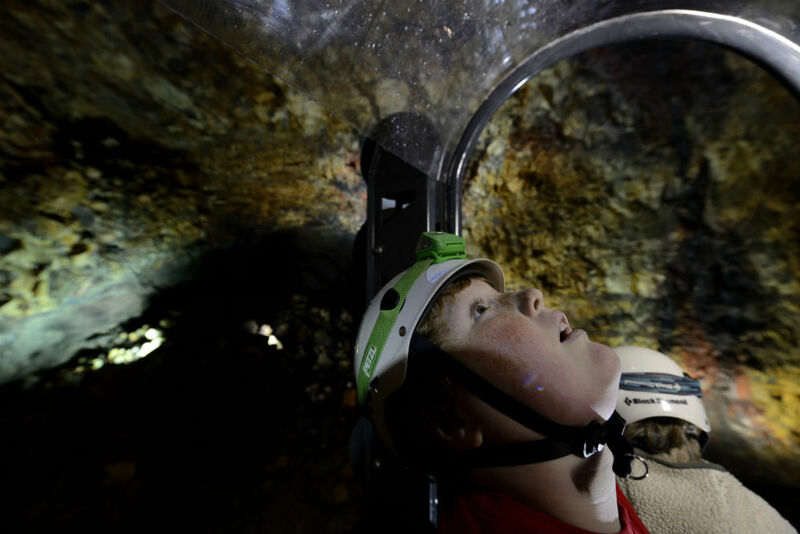 For this five-hour experience, they charge more than $300 per person. 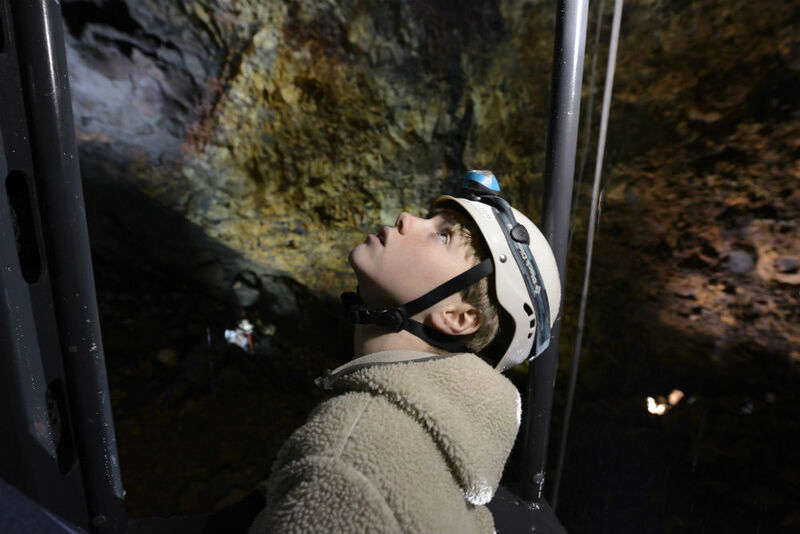 If those facts haven’t deterred you—as they didn’t deter us—then maybe a trip Inside the Volcano is an adventure for you. 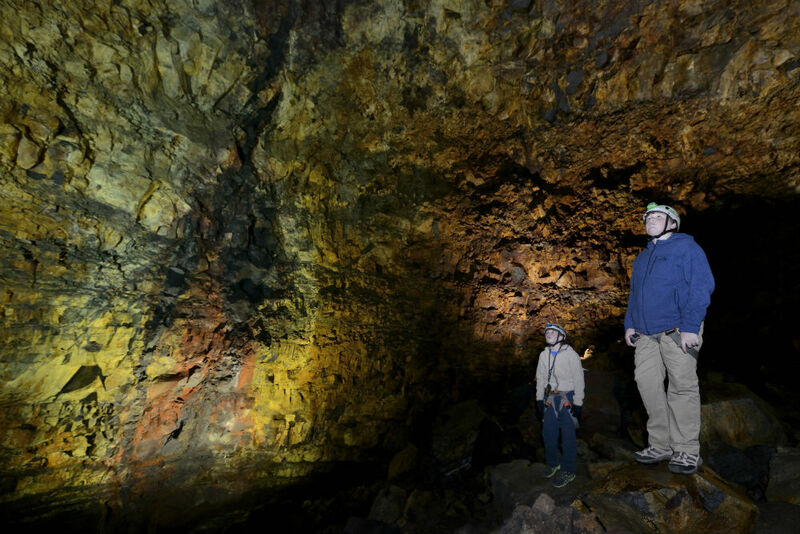 Located a short drive from downtown Reykjavik, and across from the town’s closest ski resort, is the Thrihnukagigur volcano and the Inside The Volcano experience. 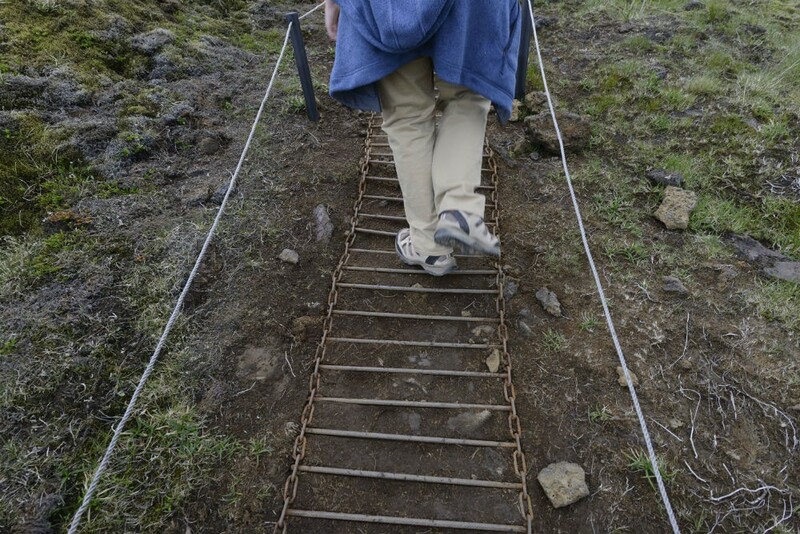 After a bus ride from our Reykjavik hotel, we took a 40-minute hike through lava fields to the basecamp. The path is rocky, and we needed to watch each step, but it’s a reasonably flat trek to the basecamp. 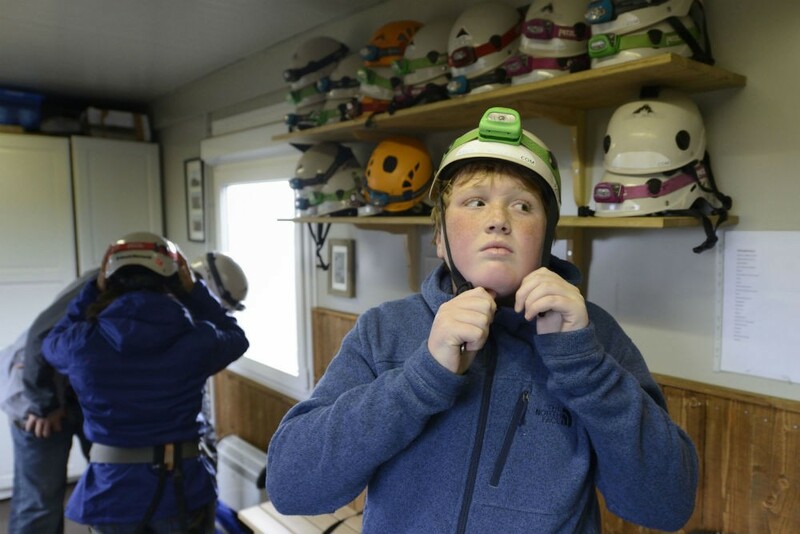 At the basecamp, we were outfitted with a hard hat; a harness, carabiners, and a lanyard to keep us from falling out of the elevator system; and a safety briefing (that assumed everything would be fine). Our favorite part of the safety briefing was learning to avoid the “iPhone Drop Zone”—meaning, the area directly under the scaffolding. It seems people using their iPhones as cameras tend to lose their grip on the device and…oops! Properly geared and trained (? 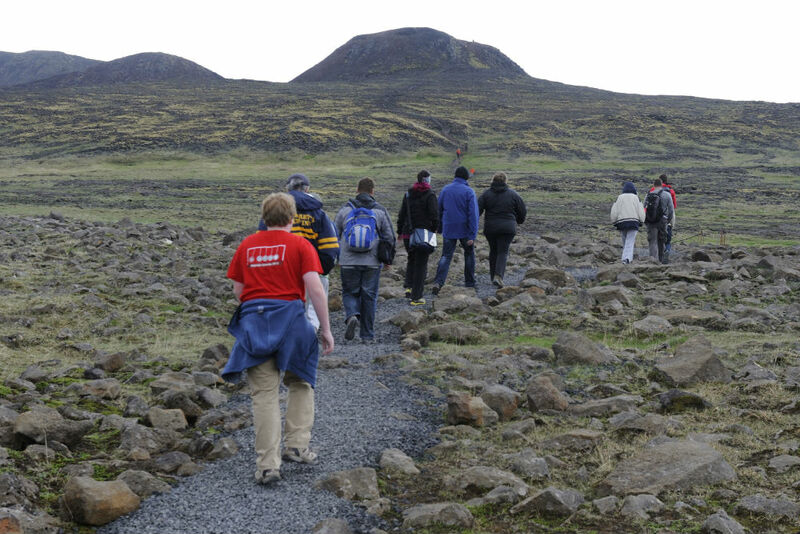 ), we walked the final push up the hill to the top of the volcano. 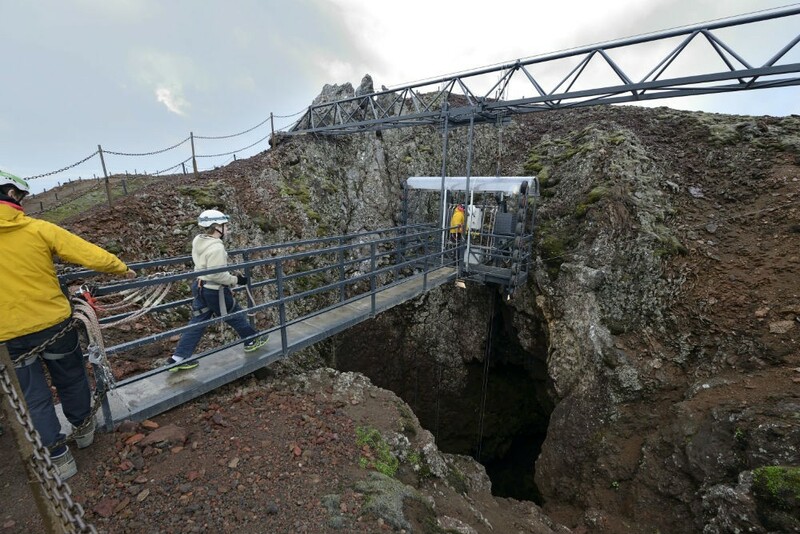 A steel structure spans the 20-foot mouth of the volcano, and the scaffolding and loading ramp hang beneath it. We strapped onto a safety line to walk the plank to the scaffold, then re-clipped the line to the scaffold itself. Along with a lift operator and five guests, we took deep breaths and secretly prayed that now was not the time for one of those frequent Icelandic earthquakes! The ride down is a slow and steady seven-minute crawl. 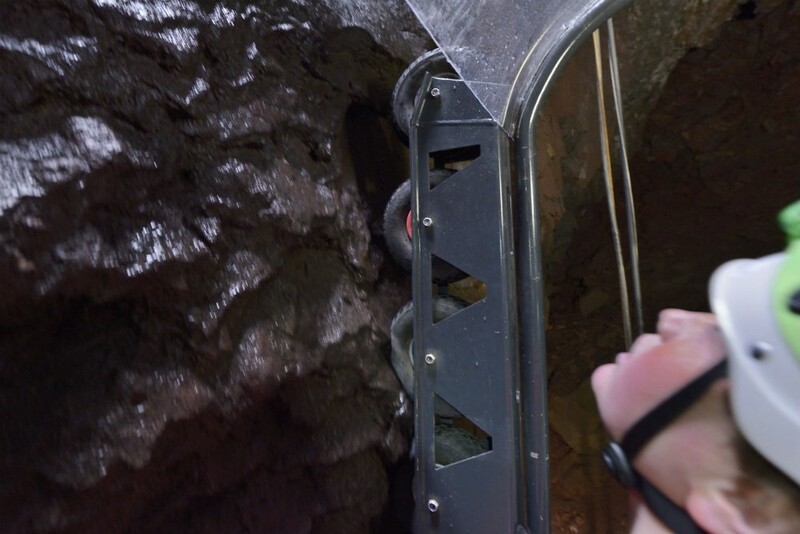 Wheels on the scaffold that would ordinarily be pressed against the side of a building are needed only for the first couple of meters of rock before you are dangling free of the walls. 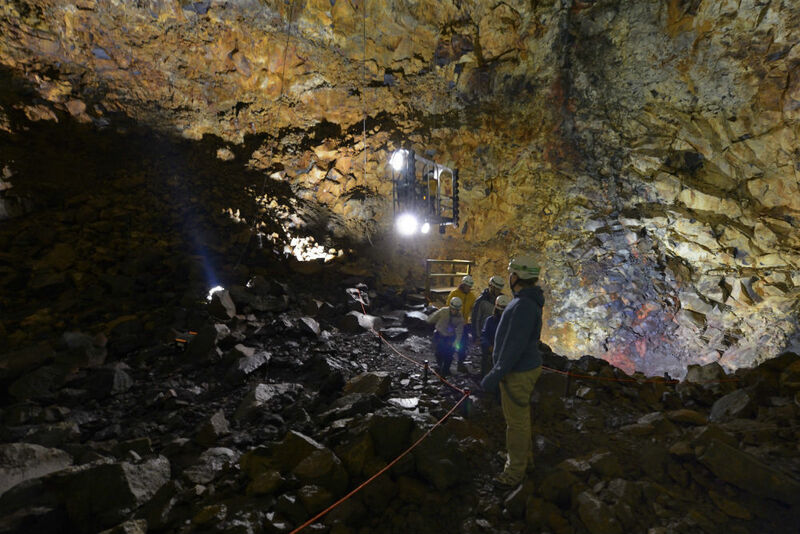 Nerves can be frayed here (especially after a small unexpected jolt on the scaffold), but already the lights on the scaffold are illuminating the extremely colorful rock walls and a blackened lava tube inside the volcano. From the outside, the volcano looks more like a mound than a classic volcano. But on the inside, it is shaped more like a giant jug. 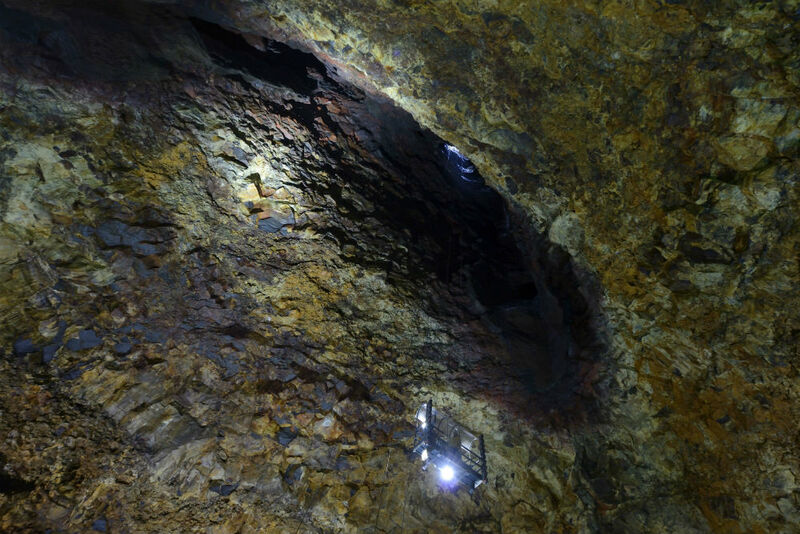 You enter through a small neck at the top of the jug and pass through several meters of the narrow neck before opening into the massive magma chamber. We felt the air cool. Inside, the temperature is always in the low 40s Fahrenheit. Thrihnukagigur is an exceptional volcano. Most volcanoes fill up with their own lava and harden. 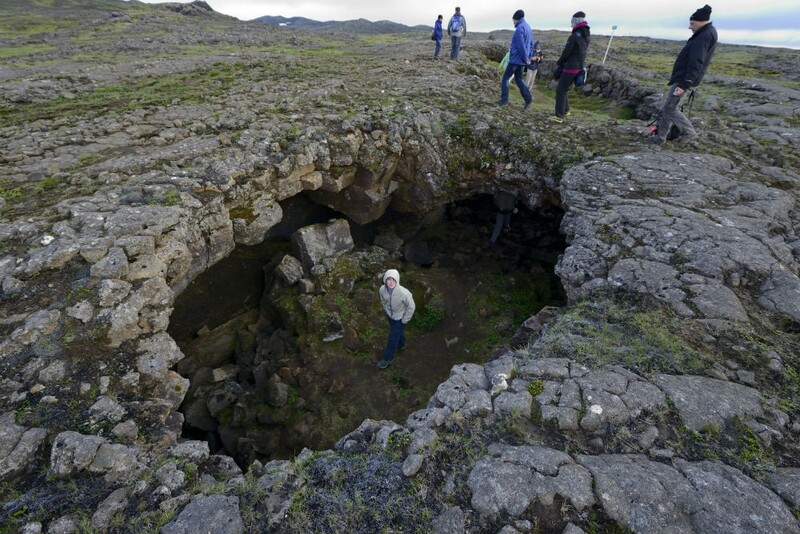 But Thrihnukagigur either emptied its lava or the lava sunk back into the earth and left the chamber exposed. About 400 feet from the top, the scaffolding stops. 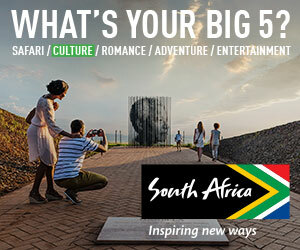 We were struck by the sheer size and beauty of the place. It’s like nothing I’ve ever seen—and, when I travel, I’m always on the lookout for things I’ve never seen. The Statue of Liberty could easily fit inside this volcano. 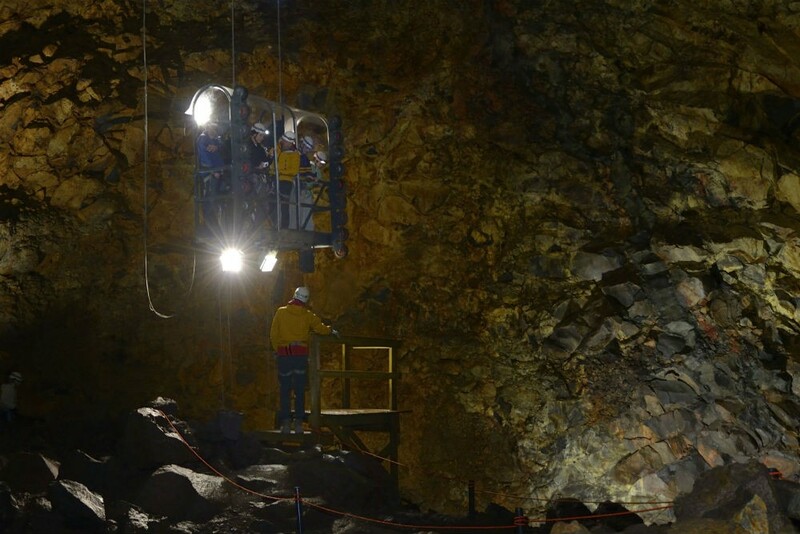 Another way to appreciate the scale of the chamber is to watch the lift system return for the next batch of visitors as a gauge to the size of the chamber. 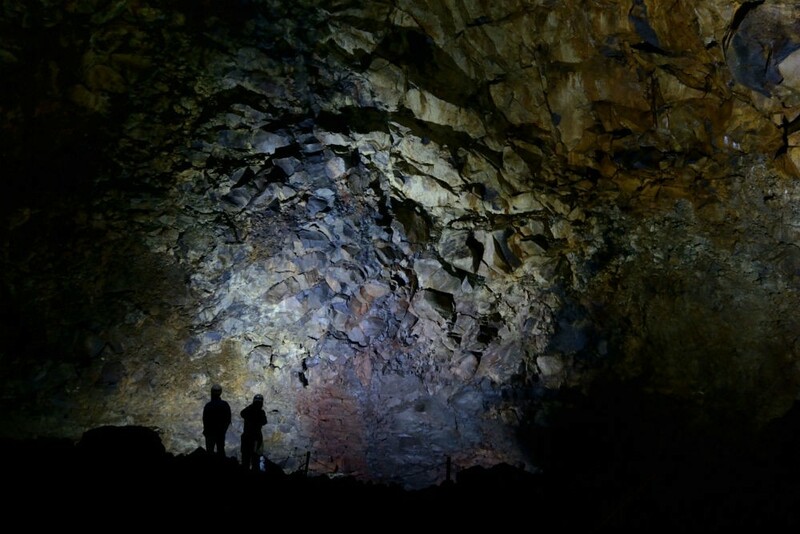 Floodlights illuminate the rock walls without overpowering the entire scene. This is a cathedral of geology. The rock walls are like giant fractals, with vivid patches of greens, blues, yellows, reds, oranges and golds. And every shade of black. It’s like looking at minerals through a powerful microscope, except that these minerals are the size of cars. Our guide told us the colors were caused by the extreme heat of the eruption superheating the naturally occurring minerals. The footing is a little treacherous, so we didn’t stray too far. We couldn’t just wander about without watching our every step because of loose rocks (probably rocks that fell to the bottom during the last earthquake). Ropes mark some of the trails and the no-go “iPhone Drop Zone”. With the floodlights directed to the walls and the small light on our helmets, we could see the floor. But only dimly. Our time at the bottom was only about 30 minutes and went by in flash. We all wished we could have spent much longer. 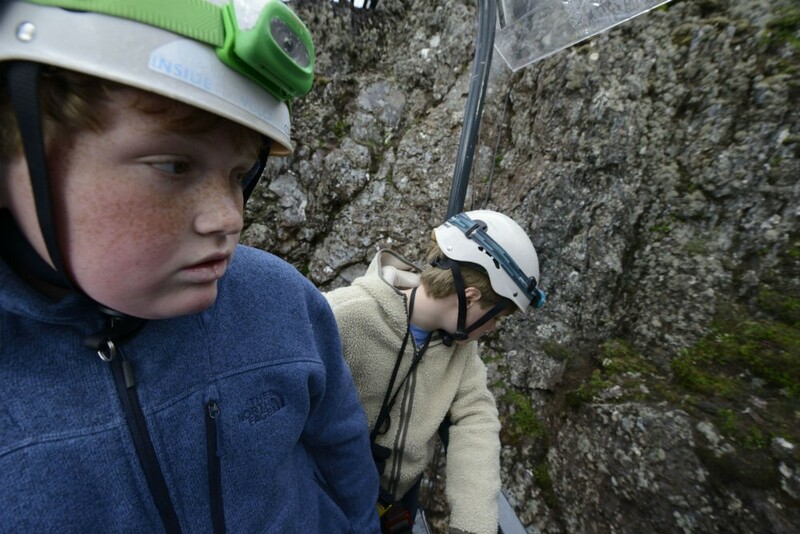 We re-boarded the scaffolding for the ascent and were soon back on terra firma. Well, as firma as Iceland gets! While we were down inside the volcano, two helicopters bringing more travelers had parked near the basecamp. The helicopter ride, while much more expensive, is a great time saver for those on a short airport layover and is also an option for those who can’t do the 6km hike to the basecamp and back. At the basecamp we were given traditional hot Icelandic meat (sheep) soup to help take the chill off the low-40s temps inside the volcano and the coolness of a cloudy Icelandic summer day. 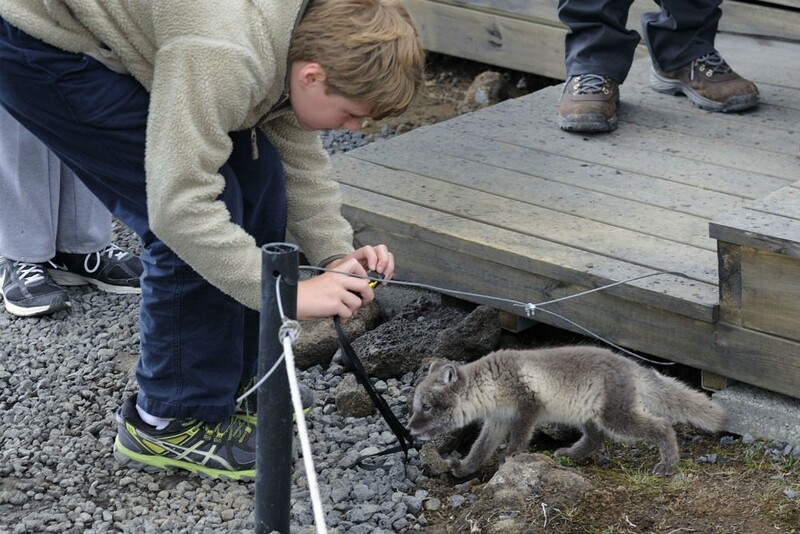 Also at the basecamp, we got a chance to get close to and even hold a young Arctic fox that had adopted the base as its home. 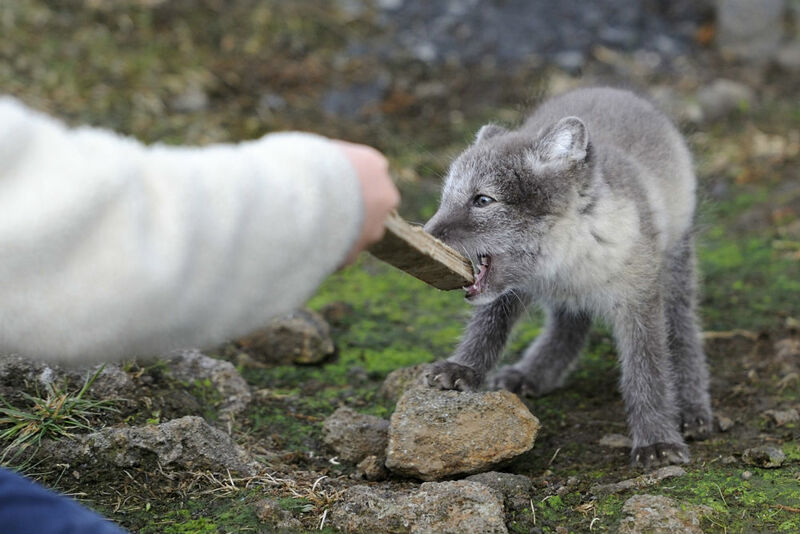 I don’t know how much longer it will be before its teeth and claws grow to a point where you won’t want to hold it and it doesn’t want to be held. 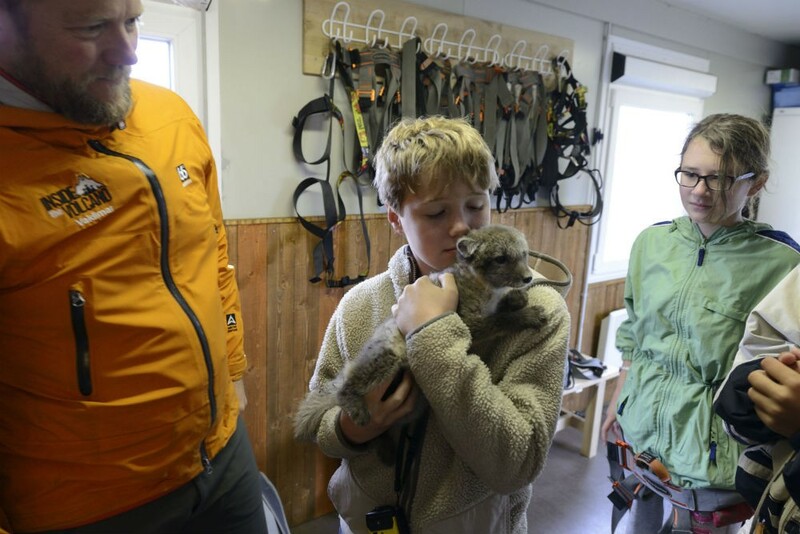 After turning in our gear, spending time with the fox, and warming up with the soup, we started our 40-minute walk back to the main road for the ride home, stopping to learn more about the lava field and to explore several lava tubes. Besides being able to say we were lowered into a volcano in Iceland, it was a truly unique experience and one of the most beautiful places I have ever visited, manmade or natural. It was well worth the angst and cost. * You do need to be in reasonable shape to attempt walking round-trip to and from the basecamp. The climb from the basecamp to the volcano is somewhat steep. But just take your time. * Hiking boots were handy but any harder-soled shoe will work. Doug was fine in his cross-training shoes. * It is chilly and you may want a fleece. Even in the summer. * A small flashlight can be handy, especially for adjusting your camera. * If you have a wide-angle lens, this is a great time to use it. * If you can set your camera to different scenes, use the night-scene-plus-flash setting. * You can buy t-shirts and other apparel at the basecamp. 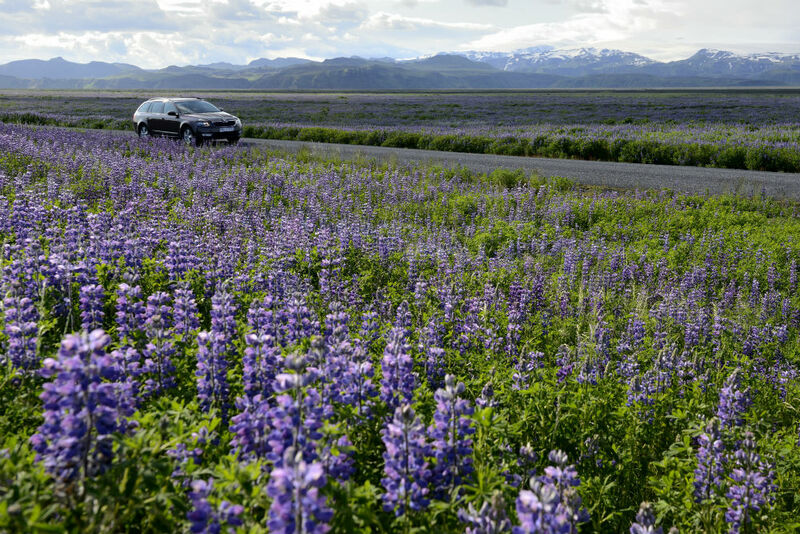 In Iceland you can pack a diverse mix of dramatic landscapes—waterfalls, geothermal pools, glaciers, geysers, black sand beaches—into just one short trip. 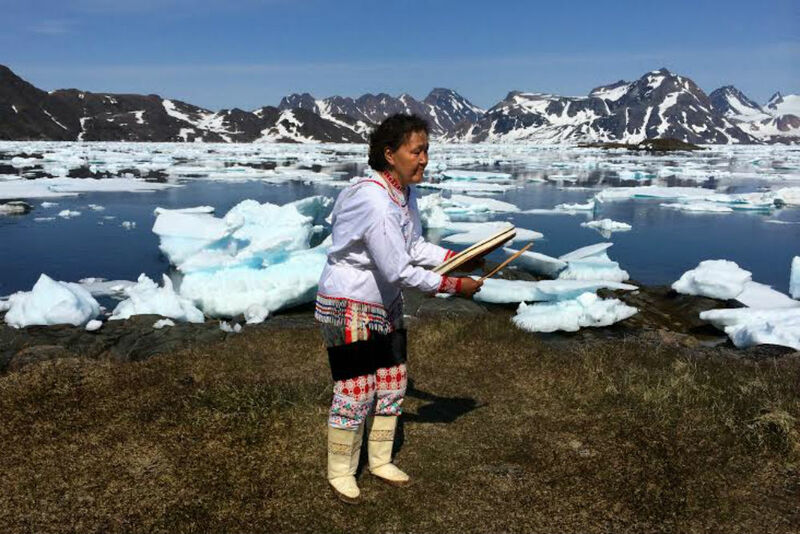 A day trip to Greenland is expensive, but is it worth it? Here are the pros and cons.